Hashida Garo ('garo' translates to 'gallery' in Japanese) is being described as a place where desserts meet art. Another brainchild of Kenjiro "Hatch" Hashida who is the chef-owner of Japanese fine dining restaurant Hashida Sushi, and Beni, an intimate establishment incorporating Japanese delicateness into French cuisine, one couldn't help but have just that little bit more of expectations than usual. Thankfully, it's not just hype. Hashida Garo really delivers on quality. Thankfully, it's rather affordable too. The sight of a large communal U-shaped table centered by a tatami platform anchoring the sparsely-decorated space wasn't too unfamiliar to me as I've seen pictures of it prior to my visit, but I wasn't prepared for the full height glass fronting the restaurant which allows inquisitive looks from curious onlookers. My first thought was, "Wah so open arh? Everyone who walk pass can see us eating leh". I had imagined it to be more enclosed and surreal. Maybe I think too much, for any attention would probably be averted to the kimono-clad resident tea master preparing a cup of ceremonial-grade Matcha ($30 per cup) for discerning tea lovers. If the price of that cup of matcha has made your eye popped, no worries as that's the most expensive option on the menu. A total of 7 selections are available, ranging from the full-bodied Sencha ($10) from Shizuoka Japan, to the slightly roasty with a hint of houjicha flavor Kagoshima Burdock Tea ($8). Whatever it is, the wagashi (traditional Japanese confections) at Hashida Garo is definitely to live for. The yuzu fan in me especially love the citrusy Yubeshi ($6 for 3 pcs). Mizu Manjyu ($15 for 3pcs), water dumplings of sweet white bean paste and seasonal fruits enclosed in smooth translucent jelly, pleases exceedingly with its refreshing taste too. And that ooh-so-meltingly-soft Mochi ($6.80 per pc) with strawberry and Valrhona chocolate is utterly irresistable! Same goes for Chocolate Yokan ($6 for 2 pcs), a thick jellied dessert made of red bean paste, Valrhona chocolate and sprinkled with a dash of sea salt from France. Made with fresh Hokkaido milk, the luscious taste of the Hokkaido Soft Cream (regular $5.50, chocolate $7, kabosu citrus $7) would probably put most of the mass-market soft serve to shame. There are also offerings of Hokkaido Cheese Cake ($3.80 per pc), Fu Manyju ($4 per pc), Anmitsu ($15), Kuzukiri ($20) and Warabi Mochi ($10), as well as Macarons ($3.50 per pc) in Japanese-inspired flavors such as yuzu, matcha, and miso! Hashida Garo is probably the closest one can get to wagashi heaven here in Singapore. My first visit to Hashida Garo was for its very unique must-must-must-try savory Foie Gras Macaron ($12 per pc), but I love the place and wagashi so much that I've been back a couple of times. Not just for desserts, but for lunch too as proper meal sets are also available. The price of a set course includes a main, wagashi and hand-picked Japanese tea of the day. I would recommend the Unagi Ippon ($27.90), a simple bento of rice with grilled eel and shredded egg, and Oz-onigirazu ($28), an assortment of seaweed-wrapped rice sandwiches for a lighter bite. Portions are small which is perfect! Because, you would want to reserve more space for desserts. 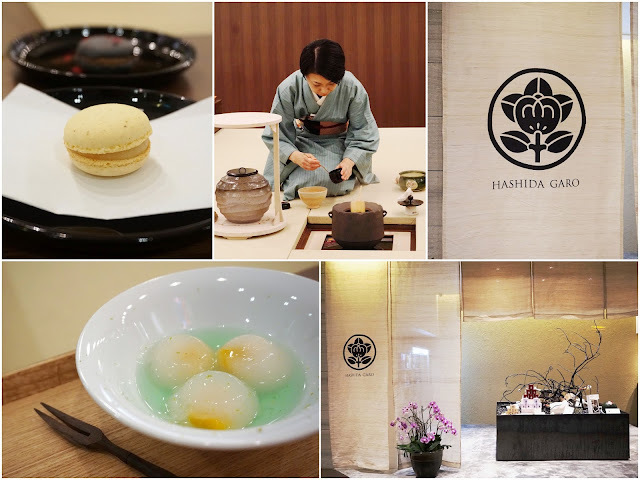 Because, you wouldn't want to miss the lovely Japanese wagashi and tea experience at Hashida Garo.